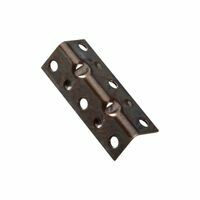 National Hardware Corner Brace, Flat, Series: 117BC3, 3-1/2 in Length, 5/8 in Width, 0.07 in Thickness, 0.24 in Diameter Mounting Hole, Steel, Zinc Plated, Includes: Screws, BHMA A138.18, For Chests, Screens and Windows Designed for chests, screens, windows, furniture, etc. Used for reinforcing inside of right angle corner joints. Screw holes are countersunk. Designed for chest, screens, windows and furniture. Designed for chests, screens, windows, furniture, etc. Used for reinforcing inside of right angle corner joints. Screw holes are countersunk. Hole sizes fit Phillips flat screws sized #7. Drill a pilot hole with a 3/32" sized drill bit when using wood screws. Designed for chests, screens, windows, furniture, etc. Used for reinforcing inside of right angle corner joints. Screw holes are countersunk. Boxed loose barcoded. Designed for chest, screens, windows and furniture. Designed for reinforcing, attaching, connecting and splicing panels and other home and industrial applications. Without screws, boxed loose. 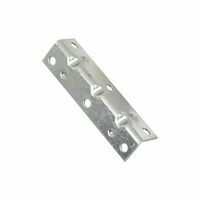 National Hardware Mending Brace, Series: 118BC, 6 in Length, 3/4 in Width, 0.11 in Thickness, 4 Mounting Holes, 0.27 in Diameter Mounting Hole, Hot Rolled Steel, Galvanized, BHMA A138.18, For Reinforcing, Attaching, Connecting and Splicing Panels and Other Home and Industrial Applications Use #8 flat head screws. Designed to join two pieces of wood together at 90 degree angles, such as on screens and frames. Screw holes are countersunk. Drill a pilot hole with a 3/32" sized drill bit when using wood screws. Reinforces right angle corner joints. Use both indoors and outdoors. Rust resistant. Reinforces right angle corner joints. Use both indoors and outdoors. Rust resistant. Designed for reinforcing, attaching, connecting and splicing panels and other home and industrial applications. Product design allows for quick and easy repair of general household items. Screw holes are countersunk. Boxed loose barcoded. National Hardware Corner Brace, Flat, Series: V115, 1 in Length, 1/2 in Width, 1 in Height, 0.07 in Thickness, 0.24 in Diameter Mounting Hole, Steel, Bright Brass, Includes: Screws, For Chests, Screens, Windows and Furniture National Hardware Corner Brace, Series: V115, 3/4 in Length, 1/2 in Width, 0.07 in Thickness, 2 Mounting Holes, 0.29 in Diameter X 82 deg Countersunk Mounting Hole, Steel, Zinc Plated, Includes: Screws, BHMA A138.18, For Chests, Screens, Windows and Furniture Use on wood in both the indoors and outdoors. Reinforces flat, right angle corner joints. Rust resistant. Reinforces flat joints, seams and cracks. Rust resistant. Used to reinforce a 90 degree angle through application on the inside. 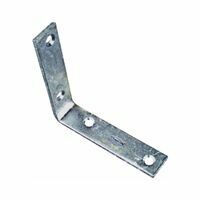 Clearance for 5/16" bolt or 2 nails per side. Extra length on one leg gives extra reach to provide greater stability. 45 degree hole pattern for nails provides easy installation option. Black powder coat finish for improved weather resistance. Used for reinforcing 90 degree angles by applying to the inside or outside of the corner. 3/8" diameter holes. Wider width provides greater area of stability for long intersections of building materials. Black powder coat finish for improved weather resistance. National Hardware Corner Brace, Double Wide, Series: V415, 1 in Length, 1/2 in Width, 1 in Height, 0.07 in Thickness, 0.24 in Diameter Mounting Hole, Stainless Steel, BHMA A138.18, For Chests, Screens, Windows and Furniture Stanley Corner Brace, Series: MP124BC, 3 in Length, Steel, Zinc Plated, BHMA A138.18 Reinforces right angle corner joints. Use both indoors and outdoors. Rust resistant. 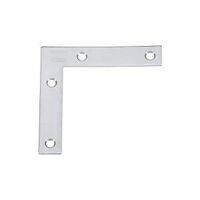 National Hardware Corner Brace, Flat, Series: V417, 2 in Length, 3/8 in Width, 2 in Height, Stainless Steel, BHMA A138.18, For Chests, Screens and Windows Used to reinforce 90 degree angles by applying to the side of the angle. Slots for 5/16" Carriage Bolt. Black powder coat finish for improved weather resistance. Heavy gauge steel bracket is used to hold steel bed frame meeting rails together; fits most standard bed frames. Zinc plated. 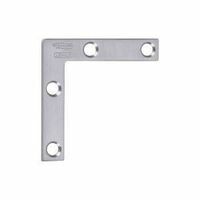 National Hardware Mending Brace, Series: V418, 2 in Length, 1/2 in Width, 2 Mounting Holes, Stainless Steel, BHMA A138.18, For Reinforcing, Attaching, Connecting and Splicing Panels and Other Home and Industrial Applications Used to strengthen a 90 degree angle by flat attachment to the side at a 45 degree angle. Clearance for 5/16" bolt or 2 nails per side. 45 degree hole pattern for nails provides easy installation option. Black powder coat finish for improved weather resistance. Use on wood in both the indoors and outdoors. Reinforces flat, right angle corner joints. Rust resistant. Adds extra support to right and corner joints. Rust resistant. 2.0 mm thickness. Designed for chest, screens, windows and furniture. 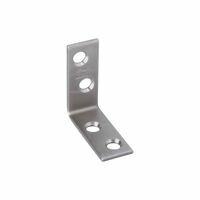 Designed for reinforcing, attaching, connecting and splicing panels and other home and industrial applications. Without screws, boxed loose. Used to reinforce 90 degree angles by applying to the side of the angle. Slots for 5/16" Carriage Bolt. Black powder coat finish for improved weather resistance. Used to reinforce a 90 degree angle through application on the inside. 1/2" diameter holes. Extra length on one leg gives extra reach to provide greater stability. Black powder coat finish for improved weather resistance. Used for reinforcing 90 degree angles by applying to the inside or outside of the corner. 3/8" diameter holes. Wider width provides greater area of stability for long intersections of building materials. Black powder coat finish for improved weather resistance. 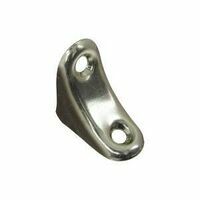 National Hardware Chair Brace, Series: V120, 1 in Length, 3/4 in Width, Cold Rolled Steel, Zinc Plated, For Corner Reinforcement on Chairs, Tables, Chests and Other Applications Used for reinforcing, attaching, connecting, aligning, and splicing materials. Slots for 5/16" carriage bolt. Black powder coat finish for improved weather resistance. Used for reinforcing, attaching, connecting, aligning, and splicing materials. Slots for 5/16" carriage bolt. Black powder coat finish for improved weather resistance. 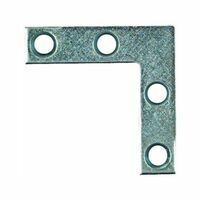 National Hardware Mending Brace, Series: 118BC, 10 in Length, 1 in Width, 0.16 in Thickness, 6 Mounting Holes, 0.32 in Diameter Mounting Hole, Hot Rolled Steel, Zinc Plated, BHMA A138.18, For Reinforcing, Attaching, Connecting and Splicing Panels and Other Home and Industrial Applications National Hardware Mending Brace, Double Wide, Series: V119, 1-1/2 in Length, 1-3/8 in Width, 1-3/8 in Height, 0.07 in Thickness, 4 Mounting Holes, 0.2 in Diameter Mounting Hole, Steel, Zinc Plated, Includes: Screws, BHMA A138.18, For Reinforcing, Attaching, Connecting And Splicing Panels And Other Home And Industrial Applications Used for attaching, connecting, aligning, and splicing materials. Slots for 5/16" Carriage Bolt. Chamfered corners provide decorative look. Black powder coat finish for improved weather resistance. 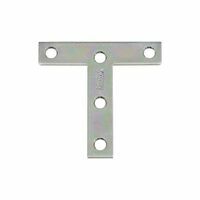 National Hardware T Plate, Series: V116, 3 in Length, 3 in Width, 0.07 in Thickness, 3 Mounting Holes, 1/4 in Diameter Mounting Hole, Steel, Zinc Plated, BHMA A138.18 Use on wood in both the indoors and outdoors. Reinforces flat, right angle corner joints. Rust resistant. 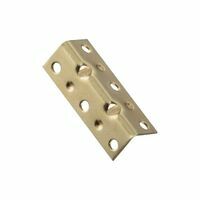 Heavy duty reinforcement for flat, right angle corner joints. For indoor and outdoor use. 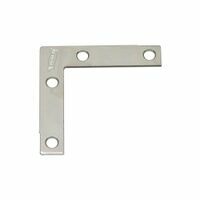 National Hardware Mending Brace, Double Wide, Series: V1192, 2-1/2 in Length, 1-3/8 in Width, 1-3/8 in Height, 0.07 in Thickness, 6 Mounting Holes, 0.2 in Diameter Mounting Hole, Steel, Zinc Plated, Includes: Screws, BHMA A138.18, For Reinforcing, Attaching, Connecting And Splicing Panels And Other Home And Industrial Applications Reinforces flat joints, seams and cracks. Rust resistant. Used to reinforce 90 degree angles by applying to the side of the angle. Slots for 5/16" Carriage Bolt. Black powder coat finish for improved weather resistance. 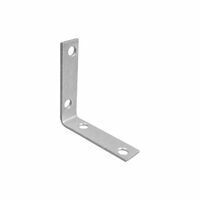 National Hardware Corner Brace, Flat, Series: V117, 3 in Length, 1/2 in Width, 3 in Height, 0.07 in Thickness, 4 Mounting Holes, 0.22 in Diameter Mounting Hole, Hot Rolled Steel, Zinc Plated, Includes: Screws, BHMA A138.18, For Reinforcing Corners on Chests Screens and Windows National Hardware Corner Brace, Flat, Series: V117, 2-1/2 in Length, 1/2 in Width, 2-1/2 in Height, 0.07 in Thickness, 4 Mounting Holes, 0.22 in Diameter Mounting Hole, Hot Rolled Steel, Bright Brass, Includes: Screws, For Reinforcing Corners on Chests Screens and Windows Used for reinforcing 90 degree angles by applying to the inside or outside of the corner. Slots for 1/2" Carriage Bolt. Square shape provides greater area of stability for wider pieces of building materials. Single bolt holes for easy installation. Rounded corners provide clean look. Black powder coat finish for improved weather resistance. 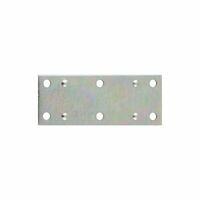 National Hardware Mending Brace, Series: V418, 3 in Length, 5/8 in Width, 4 Mounting Holes, Stainless Steel, BHMA A138.18, For Reinforcing, Attaching, Connecting and Splicing Panels and Other Home and Industrial Applications Use 3/8" bolts and/or 16d nails. Used to support the joining of a cross beam with a support beam by application to the side. FoUr superior strength plates should be used on both sides of the joint with through bolts. Reinforces right angle corner joints. Use both indoors and outdoors. Rust resistant. 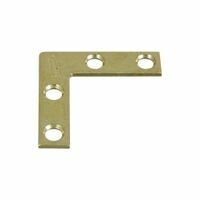 National Hardware Corner Brace, Flat, Series: V115, 2 in Length, 5/8 in Width, 2 in Height, 0.08 in Thickness, 0.33 in Diameter X 82 deg Countersunk Mounting Hole, Steel, Bright Brass, Includes: Screws, For Chests, Screens, Windows and Furniture Used to strengthen a 90 degree angle by flat attachment to the side at a 45 degree angle. Clearance for 5/16" bolt or 2 nails per side. 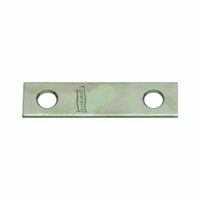 45 degree hole pattern for nails provides easy installation option. Black powder coat finish for improved weather resistance. Reinforces right angle corner joints. Use both indoors and outdoors. Rust resistant. National Hardware Corner Brace, Flat, Series: V417, 3 in Length, 1/2 in Width, 3 in Height, Stainless Steel, BHMA A138.18, For Chests, Screens and Windows Used to reinforce 90 degree angles by applying to the side of the angle. Slots for 5/16" Carriage Bolt. Black powder coat finish for improved weather resistance. Used to reinforce a 90 degree angle through application on the inside. 1/2" diameter holes. Extra length on one leg gives extra reach to provide greater stability. Black powder coat finish for improved weather resistance. 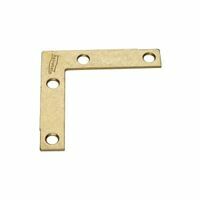 National Hardware Mending Brace, Double Wide, Series: V1193, 3-1/2 in Length, 1-3/8 in Width, 1-3/8 in Height, 0.07 in Thickness, 6 Mounting Holes, 0.2 in Diameter Mounting Hole, Steel, Zinc Plated, Includes: Screws, BHMA A138.18, For Reinforcing, Attaching, Connecting And Splicing Panels And Other Home And Industrial Applications Reinforces right angle corner joints. Use both indoors and outdoors. Rust resistant. Reinforces right angle corner joints. Use both indoors and outdoors. Rust resistant. Used to support a load at a 45 degree angle by attaching to the inside of a 90 degree angle. Clearance for 5/16" bolt or 2 nails per side. 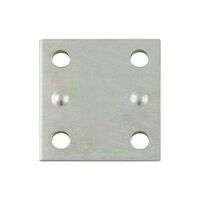 45 degree hole pattern for nails provides easy installation option. Black powder coat finish for improved weather resistance. 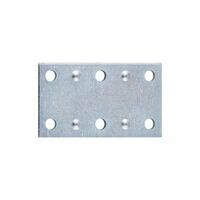 National Hardware Mending Brace, Series: 118BC, 10 in Length, 1 in Width, 0.16 in Thickness, 6 Mounting Holes, 0.32 in Diameter Mounting Hole, Hot Rolled Steel, Galvanized, BHMA A138.18, For Reinforcing, Attaching, Connecting and Splicing Panels and Other Home and Industrial Applications Reinforces right angle corner joints. Use both indoors and outdoors. Rust resistant. 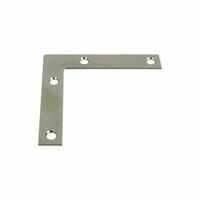 National Hardware Corner Brace, Flat, Series: V417, 4 in Length, 3/4 in Width, 4 in Height, Stainless Steel, BHMA A138.18, For Chests, Screens and Windows Used to reinforce a 90 degree angle through application on the inside. 1/2" diameter holes. Extra length on one leg gives extra reach to provide greater stability. Black powder coat finish for improved weather resistance. Used for reinforcing 90 degree angles by applying to the inside or outside of the corner. Slots for 1/2" Carriage Bolt. Square shape provides greater area of stability for wider pieces of building materials. 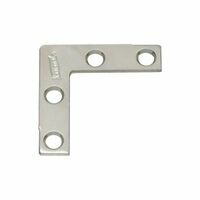 Single bolt holes for easy installation. Rounded corners provide clean look. Black powder coat finish for improved weather resistance. Used to strengthen a 90 degree angle by flat attachment to the side at a 45 degree angle. 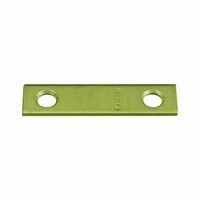 Clearance for 5/16" bolt or 2 nails per side. 45 degree hole pattern for nails provides easy installation option. Black powder coat finish for improved weather resistance. Reinforces right angle corner joints. Use both indoors and outdoors. Rust resistant. Reinforces right angle corner joints. Use both indoors and outdoors. Rust resistant. Hole sizes fit Phillips Flat Screws sized #8. Drill a pilot hole with a 3/32" sized drill bit when using wood screws. Used for reinforcing inside of right angle corner joints. Product design allows for quick and easy repair of general household items. Heavy duty, three sided construction. Screw holes are countersunk. Used to reinforce a 90 degree angle through application on the inside. Slots for 1/2" Carriage Bolt. Extra length on one leg gives extra reach to provide greater stability. Chamfered corners provide decorative look. Black powder coat finish for improved weather resistance. Used for reinforcing 90 degree angles by applying to the inside or outside of the corner. Slots for 1/2" Carriage Bolt. 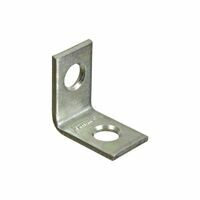 Larger bolt holes provide options for structural support. Chamfered corners provide decorative look. Black powder coat finish for improved weather resistance. Reinforces right angle corner joints. Use both indoors and outdoors. Rust resistant. Hole sizes fit Phillips Flat Screws sized #5. Drill a pilot hole with a 5/64" sized drill bit when using wood screws. Used for reinforcing inside of right angle corner joints. Product design allows for quick and easy repair of general household items. Double wide brace for greater stability. Screw holes are countersunk. Visual-pack. Hole sizes fit Phillips Flat Screws sized #6. Drill a pilot hole with a 5/64" sized drill bit when using wood screws. Used to square and reinforce 90 degree angle corner joints. Two sided, wraps around wood at corners for a more secure hold. Product design allows for quick and easy repair of general household items. Screw holes are countersunk. Visual-pack. Reinforces flat joints, seams and cracks. Rust resistant. Reinforces flat joints, seams and cracks. Rust resistant. Designed for chest, screens, windows and furniture. National Hardware Corner Brace, Series: V115, 1-1/2 in Length, 5/8 in Width, 1-1/2 in Height, 0.08 in Thickness, 4 Mounting Holes, 0.31 in Diameter X 82 deg Countersunk Mounting Hole, Steel, Galvanized, Includes: Screws, BHMA A138.18, For Chests, Screens, Windows and Furniture Use on wood in both the indoors and outdoors. Reinforces flat, right angle corner joints. Rust resistant. Hole sizes fit Phillips Flat Screws sized #5. Drill a pilot hole with a 5/64" sized drill bit when using wood screws. Designed to reinforce corners on chests screens, windows, etc. Screw holes are countersunk. Visual-pack. Reinforces right angle corner joints. Use both indoors and outdoors. Rust resistant. Reinforces right angle corner joints. Use both indoors and outdoors. Rust resistant. Hole sizes fit Phillips Flat Screws sized #6. Drill a pilot hole with a 5/64" sized drill bit when using wood screws. Used to square and reinforce 90 degree angle corner joints. Two sided, wraps around wood at corners for a more secure hold. Product design allows for quick and easy repair of general household items. Screw holes are countersunk. Visual-pack. Hole sizes fit Phillips Flat Screws sized #8. Drill a pilot hole with a 3/32" sized drill bit when using wood screws. Used for reinforcing inside of right angle corner joints. Product design allows for quick and easy repair of general household items. Heavy duty, three sided construction. Screw holes are countersunk. Reinforces flat surface joints, seams and cracks. Can be used to repair furniture. Used to reinforce 90 degree angles with miter joint by applying to the side of the angle. 5/8" diameter hole. 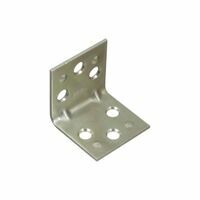 Plate width and bolt hole locations provide options for structural support. Black powder coat finish for improved weather resistance. Used to reinforce 90 degree angles by applying to the side of the angle. Slots for 5/16" Carriage Bolt. Black powder coat finish for improved weather resistance. 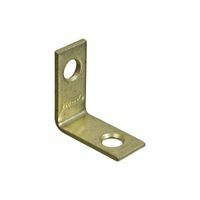 Heavy duty reinforcement for flat, right angle corner joints. For indoor and outdoor use. Hole sizes fit Phillips Flat Screws sized #6. Drill a pilot hole with a 5/64" sized drill bit when using wood screws. Used to square and reinforce 90 degree angle corner joints. Two sided, wraps around wood at corners for a more secure hold. Product design allows for quick and easy repair of general household items. Screw holes are countersunk. Visual-pack. Reinforces flat joints, seams and cracks. Rust resistant. Used to reinforce a 90 degree angle through application on the inside. Slots for 1/2" Carriage Bolt. Extra length on one leg gives extra reach to provide greater stability. Chamfered corners provide decorative look. Black powder coat finish for improved weather resistance. Used to support a 90 degree angle by application to the side. For superior strength plates should be used on both sides of the joint with through bolts. 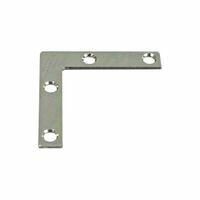 National Hardware Corner Brace, Double Wide, Series: V415, 4 in Length, 7/8 in Width, 4 in Height, Stainless Steel, BHMA A138.18, For Chests, Screens, Windows and Furniture Use on wood in both the indoors and outdoors. Reinforces flat, right angle corner joints. Rust resistant. Hole sizes fit Phillips Flat Screws sized #8. Drill a pilot hole with a 3/32" sized drill bit when using wood screws. Used for reinforcing inside of right angle corner joints. Product design allows for quick and easy repair of general household items. Heavy duty, three sided construction. Screw holes are countersunk. Designed for chest, screens, windows and furniture. Used to reinforce flat surface joints, seams and cracks. For box, chest and furniture construction or repair. Used to reinforce 90 degree angles by applying to the side of the angle. Slots for 5/16" Carriage Bolt. Black powder coat finish for improved weather resistance. National Hardware Corner Brace, Series: V115, 2 in Length, 5/8 in Width, 2 in Height, 0.08 in Thickness, 4 Mounting Holes, 0.33 in Diameter X 82 deg Countersunk Mounting Hole, Steel, Galvanized, Includes: Screws, BHMA A138.18, For Chests, Screens, Windows and Furniture National Hardware Corner Brace, Series: V115, 2-1/2 in Length, 5/8 in Width, 2-1/2 in Height, 0.1 in Thickness, 4 Mounting Holes, 0.33 in Diameter X 82 deg Countersunk Mounting Hole, Steel, Galvanized, Includes: Screws, BHMA A138.18, For Chests, Screens, Windows and Furniture Used for reinforcing, attaching, connecting, aligning, and splicing materials. Slots for 5/16" carriage bolt. Black powder coat finish for improved weather resistance. Hole sizes fit Phillips Flat Screws sized #5. Drill a pilot hole with a 5/64" sized drill bit when using wood screws. Designed to reinforce corners on chests screens, windows, etc. Screw holes are countersunk. Visual-pack. Reinforces right angle corner joints. Use both indoors and outdoors. Rust resistant. 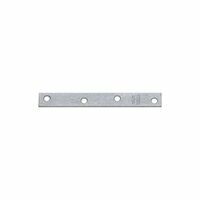 Heavy duty reinforcement for flat, right angle corner joints. For indoor and outdoor use. Hole sizes fit Phillips Flat Screws sized #6. Drill a pilot hole with a 5/64" sized drill bit when using wood screws. Used to square and reinforce 90 degree angle corner joints. Two sided, wraps around wood at corners for a more secure hold. Product design allows for quick and easy repair of general household items. Screw holes are countersunk. Visual-pack. Used to reinforce 90 degree angles by applying to the side of the angle. Slots for 5/16" Carriage Bolt. Black powder coat finish for improved weather resistance. Reinforces flat joints, seams and cracks. Rust resistant. Reinforces right angle corner joints. Screw holes are staggered in 5" and larger. Used for reinforcing, attaching, connecting, aligning, and splicing materials. Slots for 5/16" carriage bolt. Black powder coat finish for improved weather resistance. 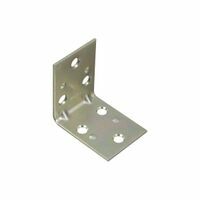 Used to support the joining of a cross beam with a support beam by application to the side. Four superior strength plates should be used on both sides of the joint with through bolts. Used for reinforcing 90 degree angles by applying to the inside or outside of the corner. Slots for 1/2" carriage bolt. Wider width provides greater area of stability for long intersections of building materials. Larger bolt holes provide options for structural support. Angle is cut from rolled structural steel and provides greater reinforcement strength than if the steel was bent into shape. Meets ASTM A6. Black powder coat finish for improved weather resistance. 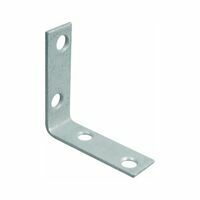 National Hardware Corner Brace, Series: V115, 3 in Length, 3/4 in Width, 3 in Height, 0.11 in Thickness, 4 Mounting Holes, 0.36 in Diameter X 82 deg Countersunk Mounting Hole, Steel, Galvanized, Includes: Screws, BHMA A138.18, For Chests, Screens, Windows and Furniture Used for reinforcing, attaching, connecting, aligning, and splicing materials. 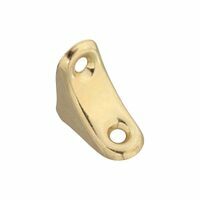 Slots for 5/16" carriage bolt. Black powder coat finish for improved weather resistance. Hole sizes fit Phillips Flat Screws sized #5. Drill a pilot hole with a 5/64" sized drill bit when using wood screws. Designed to reinforce corners on chests screens, windows, etc. Screw holes are countersunk. Visual-pack. Used for reinforcing 90 degree angles by applying to the inside or outside of the corner. Slots for 1/2" Carriage Bolt. 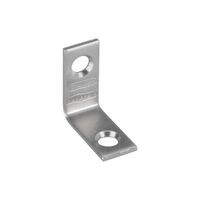 Larger bolt holes provide options for structural support. Chamfered corners provide decorative look. Black powder coat finish for improved weather resistance. Used to reinforce 90 degree angles by applying to the side of the angle. Slots for 5/16" Carriage Bolt. Black powder coat finish for improved weather resistance. Used for reinforcing 90 degree angles by applying to the inside or outside of the corner. 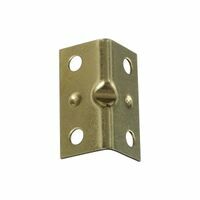 Slots for 1/2" carriage bolt. Wider width provides greater area of stability for long intersections of building materials. Larger bolt holes provide options for structural support. Angle is cut from rolled structural steel and provides greater reinforcement strength than if the steel was bent into shape. Meets ASTM A6. Black powder coat finish for improved weather resistance. Reinforces flat joints, seams and cracks. Rust resistant. Use on wood in both the indoors and outdoors. Reinforces flat, right angle corner joints. Rust resistant. Reinforces right angle corner joints. Screw holes are staggered in 5" and larger. Use on wood in both the indoors and outdoors. Reinforces flat, right angle corner joints. Rust resistant. Use on wood in both the indoors and outdoors. Reinforces flat, right angle corner joints. Rust resistant. Reinforces flat joints, seams and cracks. Rust resistant. Reinforces right angle corner joints. Use both indoors and outdoors. Rust resistant. Reinforces right angle corner joints. Use both indoors and outdoors. Rust resistant. Designed for chest, screens, windows and furniture. Adds extra support to right and corner joints. Rust resistant. 2.0 mm thickness. Use on wood in both the indoors and outdoors. Reinforces flat, right angle corner joints. Rust resistant. Use on wood in both the indoors and outdoors. Reinforces flat, right angle corner joints. Rust resistant. Adds extra support to right and corner joints. Rust resistant. 2.0 mm thickness. Reinforces flat joints, seams and cracks. Rust resistant. Reinforces right angle corner joints. Use both indoors and outdoors. Rust resistant. 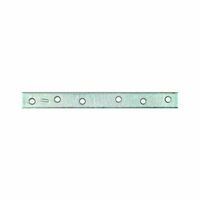 Designed for reinforcing, attaching, connecting and splicing panels and other home and industrial applications. Without screws, boxed loose. Used to support a 90 degree angle by application to the side. For superior strength plates should be used on both sides of the joint with through bolts. Designed for chests, screens, windows, furniture, etc. Used for reinforcing inside of right angle corner joints. Screw holes are countersunk. Reinforces right angle corner joints. Use both indoors and outdoors. Rust resistant. 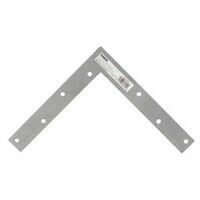 Used to support the joining of a cross beam with a support beam by application to the side. Four superior strength plates should be used on both sides of the joint with through bolts. Reinforces right angle corner joints. Use both indoors and outdoors. Rust resistant. Use on wood in both the indoors and outdoors. Reinforces flat, right angle corner joints. Rust resistant. Reinforces right angle corner joints. Screw holes are staggered in 5" and larger. Designed for reinforcing, attaching, connecting and splicing panels and other home and industrial applications. Without screws, boxed loose. Designed to reinforce corners on chests, screens, windows, etc. Designed to reinforce corners on chests, screens, windows, etc. Designed to reinforce corners on chests, screens, windows, etc. Designed for chest, screens, windows and furniture. 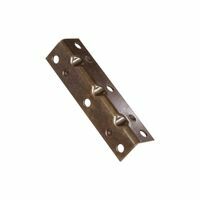 Designed for reinforcing, attaching, connecting and splicing panels and other home and industrial applications. Without screws, boxed loose. Reinforces right angle corner joints. Use both indoors and outdoors. Rust resistant. 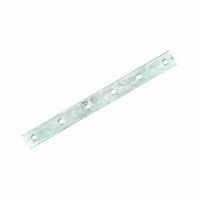 Designed for reinforcing, attaching, connecting and splicing panels and other home and industrial applications. Without screws, boxed loose. Reinforces right angle corner joints. Use both indoors and outdoors. Rust resistant. Reinforces flat surface joints, seams and cracks. Can be used to repair furniture. Use #8 flat head screws. Designed to join two pieces of wood together at 90 degree angles, such as on screens and frames. Screw holes are countersunk. Drill a pilot hole with a 3/32" sized drill bit when using wood screws. Reinforces right angle corner joints. Use both indoors and outdoors. Rust resistant. Designed to reinforce corners on chests, screens, windows, etc. Reinforces right angle corner joints. Screw holes are staggered in 5" and larger. Designed to reinforce corners on chests, screens, windows, etc. Reinforces right angle corner joints. Screw holes are staggered in 5" and larger. Reinforces flat surface joints, seams and cracks. Can be used to repair furniture. Designed to reinforce corners on chests screens, windows, etc. Product design allows for quick and easy repair of general household items. Screw holes are countersunk. 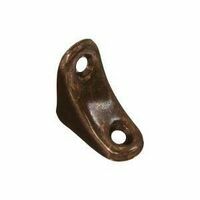 Manufactured from hot-rolled steel. Weatherguard Galvanized includes galvanized screws. Designed for chest, screens, windows and furniture. 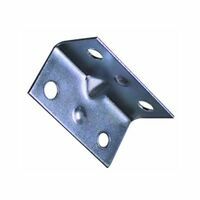 National Corner Brace, Double Wide, 2-1/2 in Length, 1-1/2 in Width, Steel, Zinc Plated, Includes: Screw, For Wood Beam Reinforces flat surface joints, seams and cracks. Can be used to repair furniture.